At Art Interiors we believe in an affordable and accessible approach to art collecting, and that everyone should be able to own an original work of art. Art Interiors represents an extensive roster of artists, with prices ranging from $25-$6,500, and has thus become a significant resource for both the novice art buyer and seasoned collector alike. From the traditional to the contemporary, the gallery houses an every-changing collection of artistic styles, including painting, photography, drawing, printmaking, sculpture and mixed media. We regularly scour the country for new, up-and-coming talented young artists to showcase in our friendly, non-elitist space. After all, most highly-priced, famous artists were once affordable up-and-coming talents. Lisa Diamond Katz and Shira Wood founded Art Interiors in 1993. Since then, they've developed a solid reputation among designers and art collectors as an excellent source for artwork by young and established artists. Appearances on over 40 television shows, and features in countless magazines, have showcased their keen eye for raw talent. Lisa Diamond Katz and Shira Wood met at the University of Western Ontario. While in university, they envisioned a place where people could buy original pieces of art at affordable prices. They partnered up, and started Art Interiors in the Forest Hill Village. Trailblazers in the industry, they established an innovative art gallery dedicated to making original art accessible and affordable, while providing a forum for artists to show their work. For over twenty years, Shira and Lisa have successfully collaborated to introduce up-and-coming artists to the public through a groundbreaking non-traditional gallery environment. They continue to seek out the very best artistic talent, while expanding their business internationally with a successful website and online store. 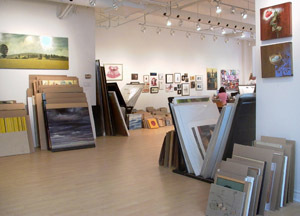 Housed in a casual studio space in Toronto’s quaint Forest Hill village, Art Interiors boasts a varied collection of over 150 artists from across Canada. In recent years, artists from as far as Italy, England, Korea and Russia have chosen to make their Canadian debut at Art Interiors. The bright and airy space has been designed to promote leisurely browsing. Visitors often spend hours flipping through the freestanding bins of works on paper and the stacks of oils on canvas that line the walls. The diverse artistic styles and friendly environment make Art Interiors a non-elitist, inclusive gallery, free from the intimidation often associated with buying art. At Art Interiors, we believe education is part of the process when it comes to buying art. In addition to being a full service gallery and exhibition space, we offer wedding registry services, gift certificates and custom framing. We are also proud to host our annual Festival of Smalls every November, in which an array of one-of-a-kind small works are sold for affordable prices: between $55-$250.